By Azzief Khaliq in Gadgets. Updated on November 18, 2017 . Have you ever wished there was another way to prototype or teach about electronic circuits other than breaking out the old-school and decidedly low-tech breadboard? Something quicker, simpler and a lot more fun? Well, you can stop wishing, because there’s a new product from Electroninks Incorporated that just might do the trick for you. The Circuit Scribe is a pen that you can use to draw working circuits on any piece of paper. No more dealing with breadboards to prototype circuits; with Circuit Scribe you can simply draw a circuit directly in your notebook or on any piece of paper, and have it work instantly. Although Circuit Scribe is certainly not the first conducive-ink pen on the market, the ink used in Circuit Scribe sets it apart from other similar products on the market. The ink is a water-based and non-toxic silver ink, which makes it perfect for classroom and educational use. 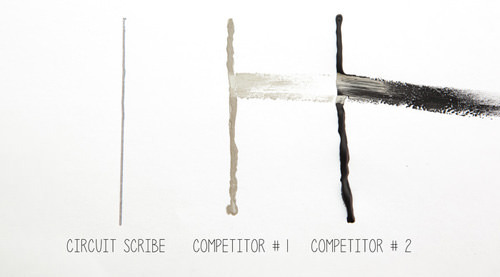 In addition, the makers claim that, unlike competing products, the Circuit Scribe’s ink does not smell, is not viscous and dries quickly. This means that there’s less chance of smudging your circuits, and less time spent waiting for your circuits to dry. In addition to the Circuit Scribe itself, the makers also provide a series of components that you can use in conjunction with the pen to make fully-fledged circuits. These range from basic components such as LED boards all the way to more advanced components such as potentiometers, 555 timers and sound buzzers. These components will snap directly onto your circuits, provided you have something magnetic behind your paper circuit. 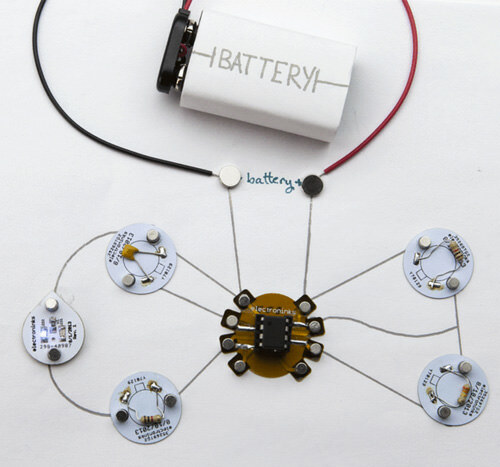 Circuit Scribe will also work with open-source hardware platforms such as Ardunio and Makey Makey, so you can integrate your paper circuits into a larger project. The Circuit Scribe pens will have enough ink to draw between 60-80 meters worth of circuits, and the lines will have a conductivity of 50-100 milliohms per square per mil. The Circuit Scribe is currently being funded on Kickstarter, and is well on its way to reaching its $80,000 goal. You can get your own Circuit Scribe by pledging just $20 if you’re in the United States.